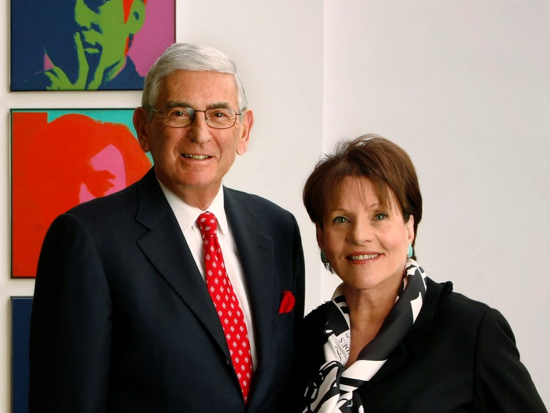 Venture philanthropist Eli Broad committed to business education at Michigan State University. Mr. Broad is a renowned business leader who built two Fortune 500 companies from the ground up over a five-decade career in business. He founded both SunAmerica Inc. and KB Home (formerly Kaufman and Broad Home Corporation). The son of Lithuanian immigrants who settled in Detroit, he graduated with honors from Michigan State University in 1954 with a degree in accounting. In 1991, Eli Broad made what was at the time the largest gift commitment ever made to a public business school. His $20 million commitment to the Eli Broad College of Business and the Eli Broad Graduate School of Management – both renamed in his honor – was designed to help Michigan State University’s new full-time MBA program emerge as one of the nation’s top graduate management programs. Throughout the years, Mr. Broad has continued to add to his original gift. He has said the Midwest land-grant university is the ideal candidate to help America regain its economic competitiveness through offering an enlightened curriculum and making quality education accessible to exceptional future business leaders from diverse cultural and economic backgrounds. “By focusing Michigan State University’s MBA program on new management realities, and not simply on theory, by addressing real-life problems of industry, and by attracting prestigious faculty and top students throughout the world, we will become more international in our thoughts and insights, and more competitive worldwide,” predicted Broad. In May 2012, Mr. Broad’s first book, “The Art of Being Unreasonable: Lessons in Unconventional Thinking,” was published by Wiley and became a New York Times bestseller. Later that year, the Zaha Hadid-designed Eli and Edythe Broad Art Museum (MSU Broad) opened on the campus of Michigan State. Funded with a lead gift of $28 million from the Broads, the world-class MSU Broad is a dynamic contemporary art museum that serves as both a teaching institution and a cultural hub for East Lansing and the region. In 2014, the Broads gave a $25 million challenge grant to the Broad College as part of Empower Extraordinary, the Campaign for Michigan State University. At the time, the gift brought their total giving to MSU to nearly $100 million. The Eli and Edythe Broad Foundation works to advance entrepreneurship for the public good in education, science and the arts. Mr. and Mrs. Broad are renowned for their tireless philanthropic efforts and lifelong commitment to giving back.